Do I have hazardous chemicals in my facility? Most warehouse, distribution centers and manufacturing facilities have hazardous chemicals in storage somewhere. Even cleaning chemicals are made of hazardous compounds unless your operations have taken the ‘green’ approach and use organic cleansers only. Flammable liquids are extremely common in manufacturing and processing facilities. What about maintenance crews? What chemicals do they use in upkeep of machinery, equipment and such? Petro-chemicals of any kinds are dangerous if not stored correctly. Are there specialty glues and adhesives on hand? Many of those are flammable and dangerous if not handled correctly. The list goes on. It’s worth taking the time to find out just what’s lurking in closets, cupboards and workbenches. 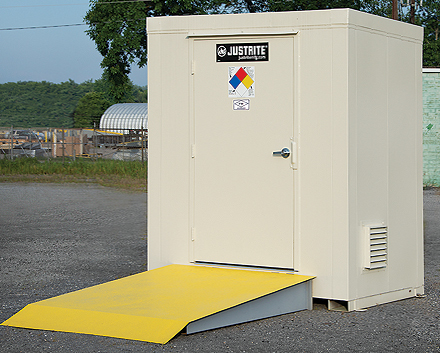 If the amount of hazardous chemicals in your facility is quite small, color coded safety cabinets are typically sufficient for your storage needs. They hold quantities of pints to 5-gallon cans usually, but check the load capacities for types of containers they accept before purchasing. Many are specifically color coded for certain types of chemicals like acids & corrosives, paint, or flammable liquids. These cabinets range in size from small utility type floor or wall mount to free standing upright cabinets, 6 to 7 feet tall. If you have chemicals in drum size quantities, you’ll want to consider setting up special storage locations or even chemical lockers for chemical drums not in active use. 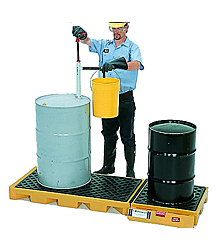 Also create special containment areas for chemicals in use. There are several different types of bulk chemical storage units from fire resistant lockers to poly containment pods. Do you need indoor or outdoor storage? How toxic are the chemical fumes? How toxic are the chemicals themselves if there is skin, eye, or mouth contact? Do you really want chemicals like that inside your building? Or accessible to just anyone? That leads to the need for lockable storage with limited access to authorized people only. Proper labeling of stored chemicals is extremely important. We tend to think that everyone else will know that the green can has gum turpentine, but what if the original can label falls off? What if someone assumes that since it’s clear in color that it’s water and throws it on a small fire? Turpentine has an odor, but not everyone may smell it. Can you afford errors like that? It’s easy to label your chemicals if you keep standard labels on hand – and no, a sticky note is not sufficient labeling. It’s best if you use a standard label format with not only the name of the chemical but the date it was stored and other MSDS information included. Waste chemicals should especially be labeled so that workers don’t mix incompatible chemicals or contaminate pure chemical batches. 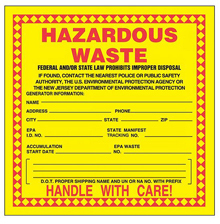 These standardized labels also come in color coded types made of plain paper or paper/poly compounds for longer durability in the presence of chemicals (since chemicals tend to corrode many materials easily). Spill containment is one of those areas where people tend to think EPA and images of little aquatic animals covered in goo while volunteers strive to clean them up. Spill containment is much more than that. It is prevention in action – prevention of slick spots people can slip and fall on, stopping drainage of spills into the potable water system, limiting the spread of toxic fumes and toxic corrosives into other areas of a facility, and more. Spill containment means your chemicals are stored where leaks can drip into containment sumps – special collection areas where leaks pool and can be pumped out for removal from time to time. 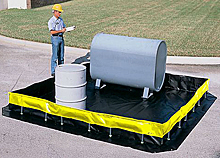 Spill containment can also be the placement of spill berms around areas where chemicals are opened, poured or distributed. These berms protect against potential spills where large amounts of chemical could occur. Instead of the spilled chemical running where gravity lets it flow, the spill is kept within the bermed area and can be collected and removed safely. As you consider chemical storage systems, whether small cabinets or large drum storage areas, make sure a sump is part of the system, and make sure the sump can hold the proper amount in the event of a spill. If your facility has an environment where there is a fire hazard in the use of chemicals, do consider fire resistant storage units. These chemical lockers or large cabinets have special fire retardant composites in their construction plus heat triggered auto closing doors, vent seals and even temperature triggered sealant material that expands to fill gaps around the doors and framework. There are also explosion resistant storage units that keep interior temperatures below extreme levels for up to 4 hours. 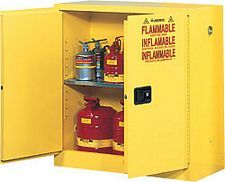 Storing chemicals in this type of cabinet assures workers can evacuate before chemicals catch fire or explode. Choosing a storage unit that has a couple of hours or more fire rating may mean the difference between putting out a fire and experiencing an explosive conflagration that takes your facility down for months or years, maybe even out of business. It truly is worth taking that extra step of safety when you think about the potential losses. 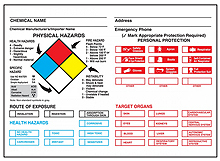 Compliance is a great way to understand what is happening to hazardous chemicals in your facility. If you conduct routine compliance inspections, your workers will naturally conduct themselves in a safer manner.